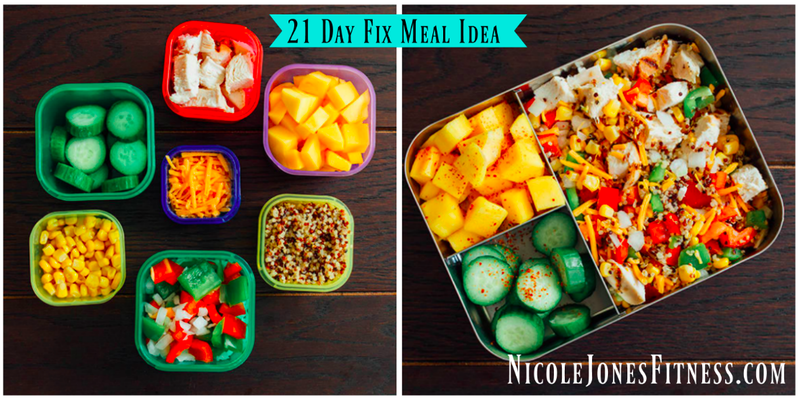 Have the 21 Day Fix but need some inspiration for meals? 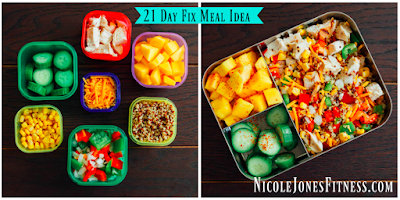 I have 4 easy and delicious lunch/dinner ideas below! Put them together, and you have this tantalizing lunch with fiber-rich pita and healthy fats to keep you feeling full. You can also stuff the salad ingredients inside the pita bread for a meal you can eat with your hands. Combine the peppers and onion, chicken, corn, quinoa, and cheese for a bold and colorful salad — no lettuce or dressing needed. Tuck a wedge of lime in your lunchbox to squeeze over the mango and cucumber slices and give them a light dusting of chili powder (trust us on this one), you can even mix them together! Buy cooked turkey breast in the deli or prepared foods section of your grocery store, or use this recipe for brined turkey breast. We served ours on a few leaves of spinach for extra color (if you use a full cup of spinach you can count an extra green container for the day!). Sautée some chopped mushrooms in a teaspoon of oil, bake a sweet potato or make sweet potato bites, and steam green beans (you can dress them up with a drizzle of olive oil, lemon zest, and chopped parsley). Simple Spaghetti Squash Pasta — and Dessert! Roasted spaghetti squash stands in for pasta topped with jarred, all-natural marinara sauce and cooked ground turkey. We roasted broccoli with a teaspoon of olive oil for about 15 minutes and finished it with shavings of parmesan cheese (you could sprinkle some of the cheese over the pasta, too). Start End the meal with apple slices and chocolate covered almonds – a dessert we can get behind!